For open type, the diesel genset will be much easier to maintainance and repair, with more durable performance and longer service life, so the cost performance is higher. 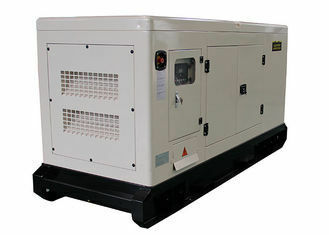 For silent type, diesel generator set, the noise level can be 68-78db(A)@7M; with silent canopy, the genset can be soundproof, rainproof, rustproof, dustproof and more safe. And STONE Power Silent type diesel generator design have European Style and also Denyo Style for your option! Stone Power,Located in Nanjing,China,which is the flourishing area of the world manufacturing,one of the largest manufacturing bases of diesel generater set in China,covering an area of 35,000㎡ and with a 10,000㎡ assembly workshop. StonePower is specilized in designing and manufacturing multi-cyclinder and multi-series industrial diesel generator sets, water pump units and relevant equipments for a variety of application ,such as telecommunication system, data center, mining, electric power, harbor equipment , engineering companies, financial systems, hotels, railways, airports,commercial buildings, hospitals, factories and etc. StonePower adopts internationally and domestically reputed high-uality engines and alternators including Cummins,Perkins Deutz,Mitsubishi,Lovol,YTO for our industrial diesel generator sets, with power range from 20kW to 1500kW and various types of design. With the compelling quality and service,StonePowerhas built a good reputation with customers in the line of generator sets, our products are exported to morethan 30 countries including Europe, Americas ,Middle East, Africa, Asia and other regions. We dedicate to make this work place safe and efficient. we are proud of our management team and employees who have best quality and deep experience in the industry. StonePower is dedicating to establishing good relationship with customers through closed cooperation and integrity. It has been constantly cooperating with excellent international and domestic enterprises to utilize the best resources to bring Stone Power to cultivate an international brand. 1) Cummins Inc., a global power leader, is a corporation of complementary business units that design, manufacture, distribute and service engines and related technologies, including fuel systems, controls, air handling, filtration, emission solutions and electrical power generation systems. Headquartered in Columbus, Indiana (USA), Cummins serves customers in approximately 190 countries and territories through a network of more than 500 Company-owned and independent distributor locations and approximately 5,200 dealer locations. 2) Dongfeng Cummins Engine Co., Ltd.(DCEC) is a joint engine manufacturer between Cummins Inc. and Dongfeng Motor. Co. DCEC provides engines with power range from 30kva to 275kva. 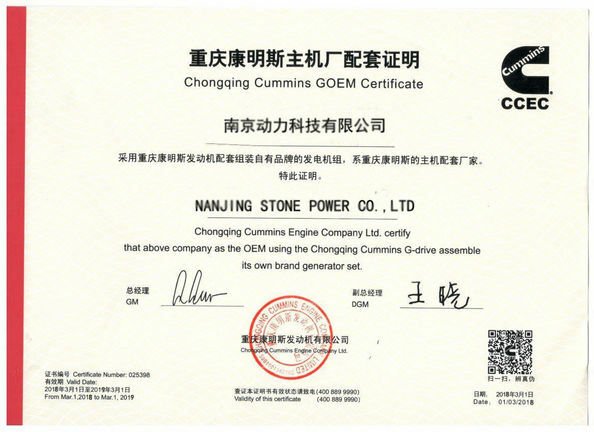 3) Chongqing Cummins Engine Co., Ltd.(CCEC) is the first production base invested by Cummins Inc. with a large power range from 275kva to 1680kva. 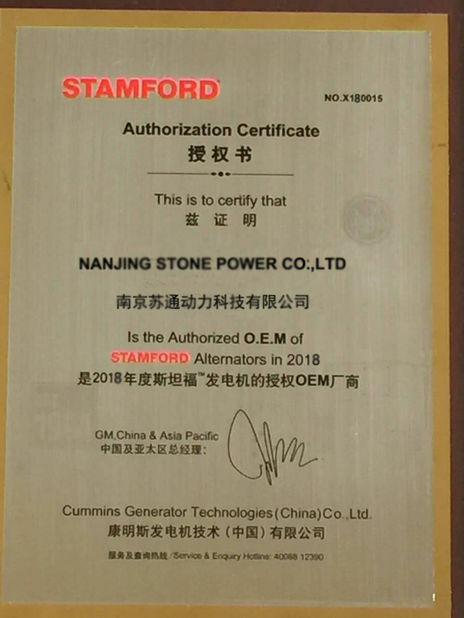 Stonepower Generators Co., Ltd is an Original Equipment Manufacturer of diesel generator sets powered by Cummins diesel engines. DCEC and CCEC are JV companies of Cummins Inc. with the power range from 25kva to 1680kva. Q1: How is your Package & Payment & Delivery Date & Warranty? A.2) Payment: by 30% T/T as deposit, 70% balance should be paid 10 days before shipment. Or 100% L/C at sight. A.3) Delivery: 25 days after we get the down payment. A.4) Warranty: All Topower goods are warranted in accordance with our warranty terms for a period of 12 months from date of despatch or 1000 running hours from date of commissioning whichever date occurs the sooner. Q2: Any advantages about your company? ---- Open, Soundproof Canopy, Container, Trailer etc. for your choose. Q3: Any advantage of Digital Control Panel? 2) Control Panel: English interface,LED screen and touch buttons. 2- Warning when low or high voltage, low or high frequency, over current, over or low speed, low or over battery voltage etc. Q4: Any catalogue for other brands and power? YES, WE HAVE! Just contact Henry for latest catalog and price list NOW!! !